If you love to make homemade salsa, you should definitely consider growing cilantro. It's a prolific herb that is easily planted, maintained and harvested. It is unique because you can get two spices from the same plant. 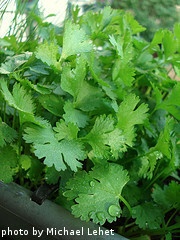 The cilantro leaves can be harvested while the plant is still young. After the plant matures, it will produce coriander seeds which also can be harvested and used in a wide variety of recipes. When growing cilantro, cooler weather is best. You can plant cilantro in the early spring and harvest the leaves before the warm weather of summer arrives. In warm weather, the plant quickly stops producing leaves and focuses its efforts on seed production. Toward the end of the summer, you can plant a second crop of cilantro and the leaves will be ready to harvest before the first hard freeze in the fall. Cilantro needs at least 6-8 hours of direct sunlight to flourish. The leaves are usually ready to be harvested about 4 weeks after planting. Coriander seeds are usually ready for harvest 6-7 weeks after planting. Cilantro plants grow well with other herbs like basil, mint and parsley. In warmer climates, if the seeds are not harvested, the plants will re-seed themselves and cilantro can be grown year round with minimal effort. Cilantro can be grown in both containers and in the ground. We typically grow two crops of cilantro. We plant it in our garden in the very late spring and leave it alone until it produces seeds. We then harvest the seeds, grind them up and store them in an airtight bag. For the cilantro leaves, we grow several plants indoors and time the planting so that the leaves start maturing around the same time as our salsa tomatoes and jalapeno peppers. For a few weeks each summer, we make and eat loads and loads of fresh, homemade salsa. Cilantro leaves are better eaten fresh. If they are dried, they lose much of their flavor. However, they can be frozen in water or blended with butter for long-term storage. Cilantro tastes great with garlic, mint, chives, citrus and cumin. It has a very bright flavor and fresh-cut cilantro fills the room with a wonderful aroma like no other. 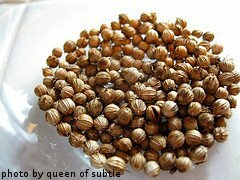 Coriander seeds have a somewhat spicy flavor that is even more intense than the leaves. The seeds can be stored for months on end. They can be ground up and used in lots of different dishes.